The fifth inductee into the Hall of Oddities is a Blarney with a Tyra hang tag. 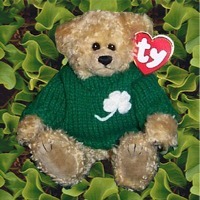 It is believed that Tyra, the short-lived cheerleader bear, was recalled with only a small number being released without pom-poms. Off came the bow, and cheerleader outfit only to be replaced with a green sweater with shamrock and Blarney hang tag. Only problem is this Blarney got through quality control with a Tyra hang tag which reads "High Spirits!"